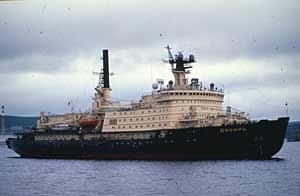 After a long period of inaction due to tight financing, the Russian nuclear fleet operator Atomflot gears up for decommissioning several of its old nuclear vessels – starting with the 1977-built nuclear icebreaker Siberia. Spent nuclear fuel and radioactive waste have been removed from the ship, and works done to ensure the hull bottom is watertight. Next in line are the icebreaker Arktika and the nuclear maintenance vessels Lotta, Lepse, and Volodarsky. Each nuclear icebreaker has its own finite useful life period – an estimated time frame that the vessel can remain in service. It is impossible to keep extending the life span of an icebreaker’s various mechanisms without risking an increased incidence of equipment malfunctions and system failures. The first to be laid to rest on Atomflot’s roster of nuclear icebreakers was the icebreaker Lenin: The veteran icebreaker is now permanently moored in the far northern city of Murmansk, retrofitted to function as a museum. Lenin’s successors will be sent for complete dismantling, beginning with the Siberia. The vessel, which was put into commission in 1977 and broke Arctic ice until it was taken out of service in 1992, has been awaiting decommissioning for 18 years. Until very recently, Russia had no sufficient means to allocate to the costly procedure. Besides icebreakers operating under extended life spans, on the books at Atomflot are decrepit nuclear service vessels – one among them, the Lepse, remains on the list of top radiation safety priorities in Russia’s north; it is laid up in Murmansk harbour, filled to the brim with damaged spent nuclear fuel – outmoded infrastructure, old technology and an ageing workforce whose experience will not be easy to replace. And while Russia has been making efforts to earmark finances to help solve its own nuclear and radiation problems, the necessary funds have been hard to come by. Decommissioning money finally started to flow in after Atomflot, the nuclear fleet operator company that was previously a structure of the Murmansk Shipping Company, was taken over by the Russian state nuclear corporation Rosatom in 2008. As for now, the Siberia is rid of its load of radioactive waste and spent nuclear fuel. The shutdown reactors currently remain on board and will only be dismantled during the cut-up. Welding works have been done on the ship while in the dock to repair the hull and ensure its floatability while the Siberia stays laid up before it is moved for dismantlement. Rosatom earlier announced that dismantling works on the Siberia would start in 2011. This, however, seems unlikely before 2015, and the cutting-up will probably be scheduled as part of the next federal target programme “Nuclear and Radiation Safety for the Period Starting 2015.” The programme, however, is still being hammered out, and it is unclear when it will be adopted. But the current nuclear and radiation safety target programme is well in progress and envisions, until 2015, the development of decommissioning projects for old icebreakers and nuclear maintenance ships, as well as setting up the RUR 500m ($16m) infrastructure needed to complete them. The service ships are the floating spent nuclear fuel storage facilities Lotta and Lepse, as well as the Volodarsky, which still has radioactive waste on board. Works are currently under way to unload radioactive materials from the Lotta. There is thus no clear deadline for when the Lotta is expected be towed away for the cut-up. Atomflot was planning to complete the dismantlement of all three service ships by 2015, but, according to Abramov, there is as yet only enough money to put together the decommissioning projects for the vessels. There is one hopeful exception: The Lepse, one of Russia’s longest unsolved radiation safety issues, may soon expect decommissioning works to finally start within the framework of an international decommissioning project. Earlier this year, Bellona wrote an open letter to the Rosatom’s head Sergei Kiriyenko asking that he clear the bureaucratic hurdles blocking the Lepse’s decommissioning and expedite the process. The Lepse was in service between 1963 and 1981, supplying fresh nuclear fuel and unloading spent fuel from nuclear-powered icebreakers. The necessity to decommission the Lepse was well recognised as early as 1989, and the first remediation project for the Lepse was initiated by Bellona as far back as 1994, when international donors started pledging funds to help safeguard this floating hazard. But sixteen years on, the project is still spinning its wheels. The Lepse has still not been unburdened from the high-level radioactive waste and damaged nuclear rods stored in its holds and is still laid up at an Atomflot wharf just two kilometres from the residential buildings of Murmansk. According to Atomflot, the immediate plans will see radioactive waste unloaded from the vessel and the ship itself decontaminated to ensure personnel safety while removing the spent nuclear fuel on board and during the subsequent cutting-up. Repairs have already been done on the hull bottom, prolonging the Lepse’s floatability for another ten years. Atomflot may have decided to play it safe in case the Lepse’s life span were to be extended. But given the decrepit state of Russia’s decommissioned nuclear fleet, this could indeed be a wise precaution: In early June, another former nuclear maintenance vessel, the Severka, which was used to shuttle shipping containers with spent nuclear fuel before the 1990s – and by 2010 itself constituted radioactive waste – was reported to have sunk at the wharf of a shiprepairing yard in Alexandrovsk on the Kola Peninsula, in close vicinity to the large administrative centre of Murmansk. Atomflot reports that an international consultant has already been chosen to ensure all works on the Lepse meet international standards and are done in conformity with internationally accepted technologies. Before 2010 is out, contracts are expected to be concluded with the shiprepairing yard Nerpa, located in Snezhnogorsk in Murmansk Region. Both of these stages – including towing the Lepse to the yard – were previously scheduled for completion by 2009. Andrei Ponomarenko, nuclear projects coordinator in Bellona-Murmansk, says there are indications that things are finally starting to move in the right direction.